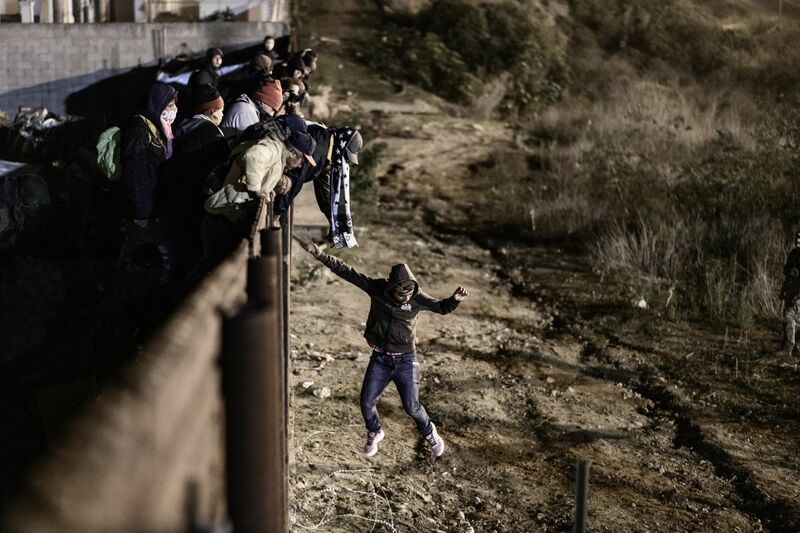 A migrants jumps the border fence to get into the U.S. side to San Diego, Calif., from Tijuana, Mexico, Tuesday, Jan. 1, 2019. Tens of thousands of U.S. immigration officers and agents are showing up for work each day to guard the Mexico border, where President Donald Trump insists on putting a wall. But the government is shut down, so no one is getting paid. And when U.S. companies and employers want to check the immigration status of potential hires, they are greeted by a red banner across the top of the government's E-Verify website. Those services are "currently unavailable due to a lapse in government appropriations," it says. Twelve days into the standoff over Trump's $5 billion border wall demand, major components of the U.S. immigration system are offline, out of order or under worsening strain. And while the administration threatens to crack down on companies who hire unauthorized workers, the funding freeze has crippled the main compliance tool for employers trying to make sure they're following the law. Deb Wakefield, an employment attorney in Dallas, said she's heard from several clients in the past few days who say they cannot complete the hiring process at their manufacturing plants because E-Verify is down. Her clients include a mattress factory and a chemical plant, she said, and both employers hire a lot of immigrants. "They're saying 'we can't run E-Verify, what are we supposed to do?,' " she said. "But all they can do is wait." U.S. Border Patrol agents, Immigration and Customs Enforcement officers and other front-line enforcement personnel at the Department of Homeland Security remain on duty as "essential" workers, but with little more than an assurance they will eventually be paid. Agents are taking into custody more than 2,000 migrants per day on average, according to the latest Customs and Border Protection statistics, and 65 percent of those border crossers are families and children. With nowhere to detain them, the government has been releasing hundreds onto the streets in El Paso, Texas, and Yuma, Arizona, and other border cities. "These front line federal employees are key to our nation's security and economic success, and they do not deserve to be treated this way," said Tony Reardon, president of the National Treasury Employees Union, which represents the blue-uniformed U.S. Customs and Border Protection officers, as well as agriculture inspectors and other staff stationed at border crossings and airports. Reardon said those workers are doing their jobs "without knowing when they will receive their next paycheck." "They have worked through the holiday season, many had scheduled leave canceled at the start of the shutdown, yet they continue to protect our country," he said. "Like many of us, they are opening the usual bills for mortgages, rent, utilities and food. They are not, however, opening a paycheck." Trump has often showered praise on Border Patrol agents and ICE officers, earning broad support among their rank and file. But a prolonged shutdown could sap that support if morale at the border suffers. Leaders of the unions who represent Border Patrol agents and ICE officers - outspoken Trump supporters - did not respond to requests for comment. Yet there are another 179,000 DHS employees who remain on the job unpaid, in addition to 32,000 furloughed until the White House and lawmakers can reach a deal. "The dedicated men and women of DHS are fully prepared to protect the homeland and keep Americans safe during this lapse in government funding," said DHS spokesman Tyler Houlton. "We urge Congress to fully fund DHS in order to pay the federal employees on the front lines defending our nation." But Ashley Tabaddor, president of the National Association of Immigration Judges, the union that represents the country's approximately 400 judges, said the impact of the disruption has been "immense."